Dundee: UNESCO City of Design, the only UK City listed in Lonely Planet’s top ten European destinations for 2018; home to a new museum designed by an internationally-renowned architect, a redesigned and revived waterfront, a new railway station and a new airport building with a reactive façade which adjusts to Scotland’s varying daylight levels and …oh, wait. 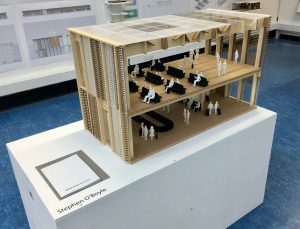 The last of those achievements is not quite real yet but was one of the intriguing designs to be found in the annual Architecture Degree show at the University of Dundee. The proposal was Stephen O’Boyle’s response to the brief to transform Dundee’s currently small and utilitarian airport buildings into something more visually impressive and ahead of its time. Amongst a number of other Fifth-Year students who worked on the same project, Junyuan Yan produced a striking design using digital tools to plan the use of timber on a non-domestic scale. The result? A complex and beautifully organic roof structure somewhat reminiscent of ancient cathedral ceilings. Another group of Fifth-Year students addressed the issue of incorporating modern architectural elements into a mediaeval city. Based on their study of the city of Mons, the students tackled such issues as the repurposing of existing buildings, the creation of appropriate new buildings, and the use of ornament. These are very much real-world challenges for contemporary city planners. In contrast, students on the rooms+cities project took an unashamedly Utopian approach, re-imaging Scottish cities as they might ideally be. While this might sound idealistic it is important to note that their work has been grounded in some very detailed and interesting historical research. They studied architectural plans and historical maps for the seven cities of Scotland, creating a fascinating cross section of spatial and historical imagery showing the differential developments in these cities. This is probably the first comparative architectural survey of these cities. Working from this basis the students have re-thought the cities as a continuous surface of rooms, looking beyond the normal divisions of city space into public and private, interior and exterior, built and unbuilt, to create a new vision of the urban landscape. 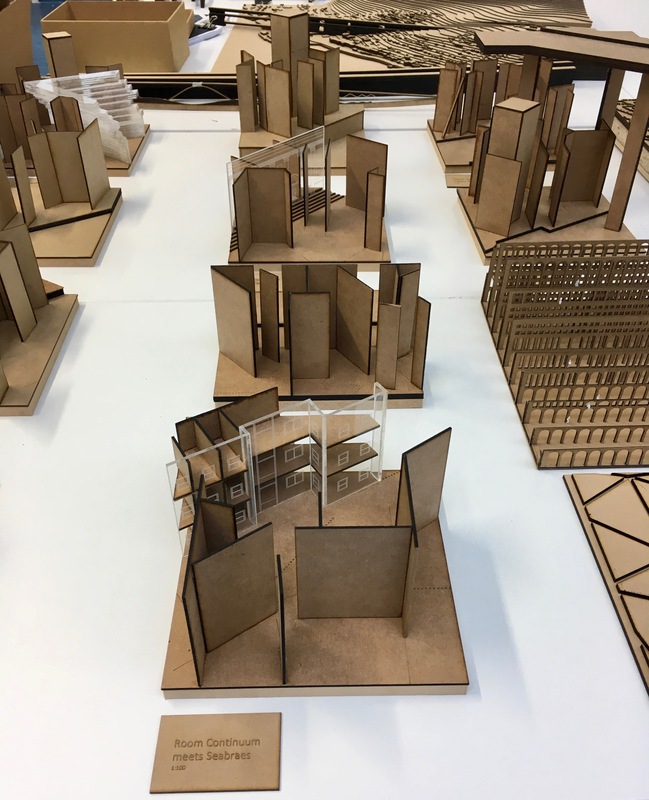 The Macro-Micro brief allowed students to explore the possibilities of redesigning the use of soft wood timber (Sitka Spruce) and sustainable strategies to create small scale vernacular buildings. Among these were Laura Farquhar’s attractive Mountain Hut and Scott Morrison’s Forest House. Fourth year students’ work also proved compelling. 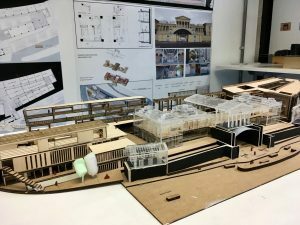 Dundee was again a useful resource, encouraging students to consider ways of regenerating the city, and creating new types of living spaces for the elderly and dementia sufferers among others. Projects have not, however, been restricted to the immediate local environment. The project to design an urban campus in Glasgow allowed Jason Jingsong Wu to develop a design for a horticultural college inspired by the shape of ancient Mayan temples. 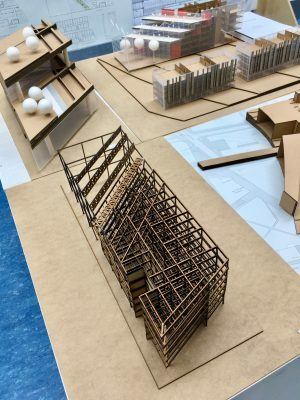 Another studio project addressed some of the existing plans for the development of well-known sites in Edinburgh and briefed students to develop their own proposals. Among the students rising to the challenge of altering one hotly-debated site, Carol Kaiyu Ma transformed the Royal High School into a luxury hotel. In similar vein, Tristan Rabaeijs looked at the possibility of creating a wrap-around building for Edinburgh’s Summerhall creating a hub for start-up and small businesses in a unified and stimulating working environment. The exhibition contained work from all years, including some of the best work of the first and second year classes. The Architecture Show once again showed us what a highly-skilled student team are capable of, enabling us to look around our own built environment with new eyes.